It can be configured to switch at up to 6 different times during a 24 hour period. In addition, it can be programmed to operate on a wide variety of days. eg. Daily, Week days only, Weekends only, Every second day, or selected group of days. 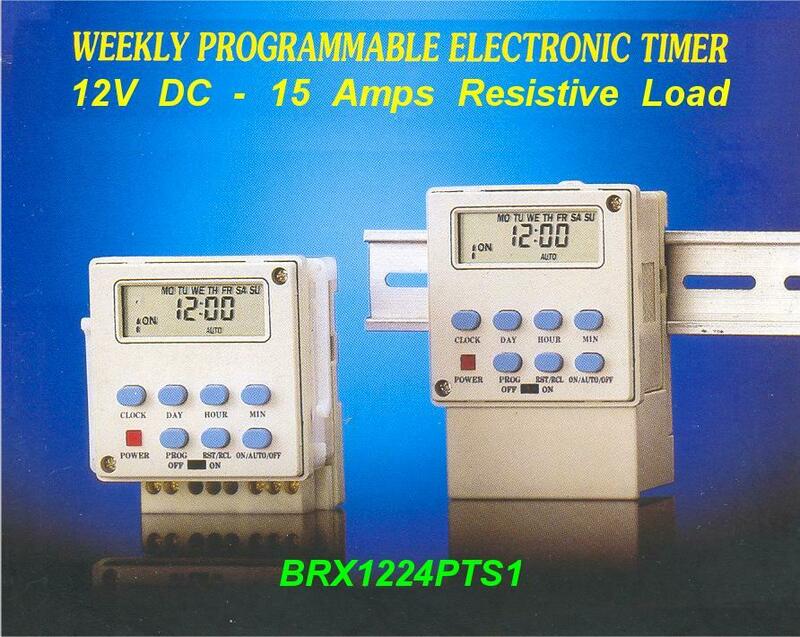 The BRX1224PTS1 allows for Switch-on and switch-off times to be set for each program. i.e. allows a different "on" duration for each program. In the event of a power failure, the switch retains its program data via a long life rechargeable NiCd battery. - 24 Hr Programming from 1 minute to 23:59/day. - Up to 6 events per day for a maximum of 42 ON-OFF events per week. - A 15A fuse is strongly recommended for each installation as it will assure a long life for the timer as it will avoid overload of the system.